Glow is an easy-to-use distributed computation system written in Go, similar to Hadoop Map Reduce, Spark, Flink, Storm, etc. Save chrislusf/glow to your computer and use it in GitHub Desktop. Glow is providing a library to easily compute in parallel threads or distributed to clusters of machines. It will run the input text file, '/etc/passwd', in 3 go routines, filter/map/map, and then reduced to one number in one goroutine (not exactly one goroutine, but let's skip the details for now.) and print it out. This is useful already, saving lots of idiomatic but repetitive code on channels, sync wait, etc, to fully utilize more CPU cores. However, there is one more thing! It can run across a Glow cluster, which can be run multiple servers/racks/data centers! To setup the Glow cluster, we do not need experts on Zookeeper/HDFS/Mesos/YARN etc. Just build or download one binary file. Glow Master and Glow Agent run very efficiently. They take about 6.5MB and 5.5MB memory respectively in my environments. I would recommend set up agents on any server you can find. You can tap into the computing power whenever you need to. This will "steroidize" the code to run in cluster mode! The word_count program will become a driver program, dividing the execution into a directed acyclic graph(DAG), and send tasks to agents. 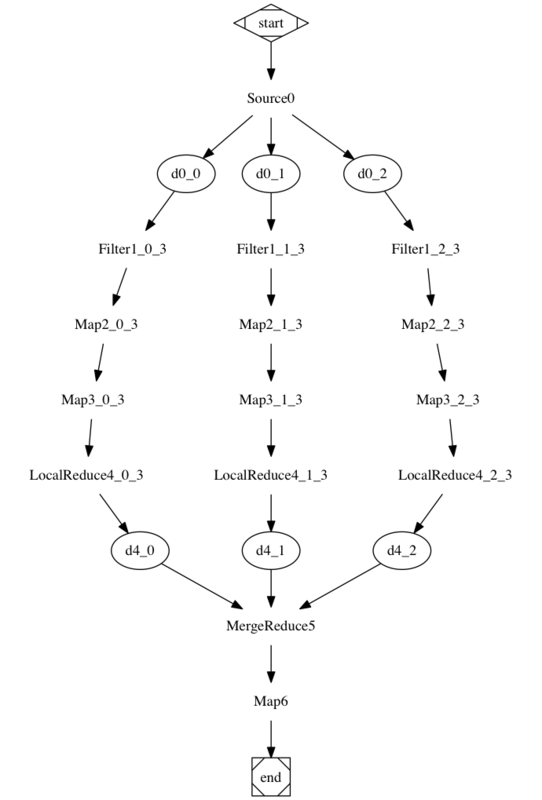 To understand how each executor works, you can visualize the flow by generating a dot file of the flow, and render it to png file via "dot" command provided from graphviz. Docker is not required. But if you like docker, here are instructions. GOOS=linux GOARCH=amd64 CGO_ENABLED=0 go build . docker build -t glow . See examples/ directory for docker-compose setups. Start using it! And report or fix any issue you have seen, add any feature you want.